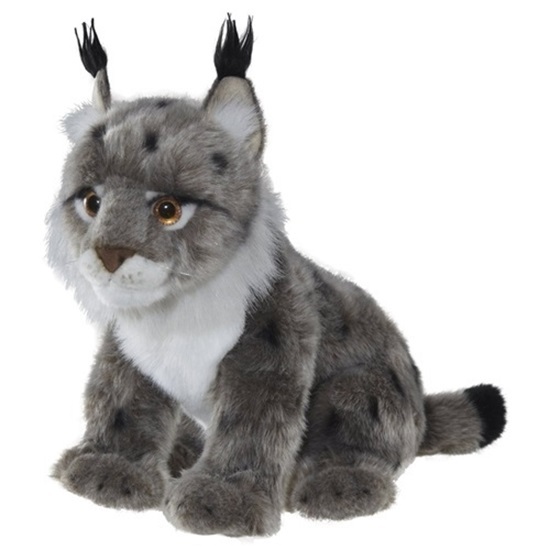 Made from the highest quality plush, this 11 inch Lynx is a very realistic looking stuffed animal..
From Aurora's Signature Collection, the grace, beauty, and vitality of this Lynx has been captured like no other. Made of a soft, plush gray fur, airbrushed details are scattered throughout the body, tail, and head. This Lynx has a hand embroidered plush brown nose, and copper colored plastic eyes. White plush fur runs along his chest, and the inside of his ears, while his tail, and the tips of his ears are tipped in black plush fur. Individually hand cut, hand sewn, and hand shaded, this gorgeous animal is a wonderful addition to any collection. He is surface washable.